Floating knee refers to the fracture of ipsilateral [same side] fractures of tibia and femur. This makes knee unattached to tibia or femur, therefore name floating knee is given. The word floating knee was introduced for the first time by McBryde in 1965. Floating knee injuries may include a combination of diaphyseal, metaphyseal, and intra-articular fractures. Most of the patients are in their third decade with a preponderance of males. Floating knee has been reported in the pediatric population as well. Floating knee is not a common injury. Road traffic accident accounts for a majority of the cases and this is followed by a fall from height. These injuries are they are also associated with potentially life-threatening injuries of other parts of the body. Pure diaphyseal fracture of the femur and tibia. A fracture that extends into the knee, hip, or ankle joint. Type IIa -Femoral shaft and tibial plateau fractures. Type IIb -Fractures of the distal femur and the shaft of the tibia. Type IIc – Fractures of the distal femur and tibial plateau. The classification does not classify patients with epiphyseal separation in the distal femur and tibia or how to describe the location of open fractures. The patient would present with injury to the limb or the injury may be found on assessment of a polytrauma patient. Therefore complete limb examination must be done in cases of femoral or tibial fractures. The neurovascular deficit must be specifically looked for as these fractures are frequently associated with damage to the vessels ( popliteal and posterior tibial arteries) and the nerves (eg, peroneal nerve) are common. The incidence of open fractures is 50-70%, at single or both fracture sites. Tibial fracture has a higher frequency of being open. Injury to the knee ligaments especially Anterolateral rotatory instability is the commonly found. Knee joint injury is indicated by substantial hemarthrosis. Include views of the joint above and below. X-ray of the pelvis and both hips. Anteroposterior and lateral views of the affected knee. Done in with suspected ligament injuries. In adults, non-operative treatment is associated with shortening and angulation and have been dually replaced by internal fixation techniques. In children, the non-operative treatment is done by initial skeletal traction for the femoral fracture with closed reduction and casting or splinting for the tibial fracture. Once the femoral fracture has healed sufficiently, hip spica is applied. A hip spica cast is applied when sufficient femoral healing has occurred. Malunion, nonunion, refracture, and limb-length discrepancy are documented in almost 50% of patients receiving conservative treatment. Early stabilization of both femoral and tibia fractures and early mobilization of the patient is done to facilitate better care and quicker recovery. Intramedullary nails in both femur and tibia are the best modality. In fractures where nailing cannot be done, a spanning external fixator is applied till the internal fixation could be undertaken. Treatment is decided on an individual basis and different combinations of surgeries could be approached. The nailing could be done in an antegrade manner or femoral nail could be done retrogradely and tibia antegradely, utilizing the same incision on the knee. In the metaphyseal region of the tibia and/or femur with or without intra-articular extension, stabilization can be achieved by using locking plates. Plate fixation offers an anatomic reduction of the articular surface and allows early mobilization and better functional outcome. Early diagnosis of ligamentous injuries is essential to facilitate appropriate rehabilitation. 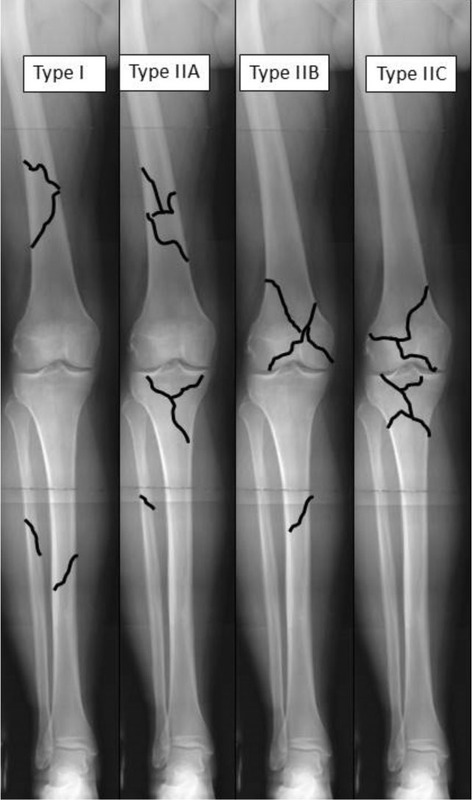 In the pediatric population, open growth plates may lead to unique complications including overgrowth of the bone after a fracture and premature closure of the ipsilateral physis, genu valgum, and physeal arrest. Infection is another serious complications. Involvement of the knee joint, severe trauma to the soft tissues, fracture comminution, and open fractures are associated with increased complication rates resulting in worsened functional outcomes. Fraser RD, Hunter GA, Waddell JP. Ipsilateral fracture of the femur and tibia. J Bone Joint Surg Br. 1978 Nov. 60-B(4):510-5. Rethnam U, Yesupalan RS, Nair R. The floating knee: epidemiology, prognostic indicators & outcome following surgical management. J Trauma Manag Outcomes. 2007 Nov 26. 1(1):2. Karlström G, Olerud S. Ipsilateral fracture of the femur and tibia. J Bone Joint Surg Am. 1977 Mar. 59(2):240-3. Letts M, Vincent N, Gouw G. The “floating knee” in children. J Bone Joint Surg Br. 1986 May. 68(3):442-6. Yue JJ, Churchill RS, Cooperman DR, et al. The floating knee in the pediatric patient. Nonoperative versus operative stabilization. Clin Orthop Relat Res. 2000 Jul. (376):124-36. · Kao FC, Tu YK, Hsu KY, Su JY, Yen CY, Chou MC. Floating knee injuries: a high complication rate. Orthopedics. 2010 Jan. 33(1):14. Yokoyama K, Nakamura T, Shindo M, et al. Contributing factors influencing the functional outcome of floating knee injuries. Am J Orthop. 2000 Sep. 29(9):721-9.